Wonder where all that sound is coming from? The technical answer-from a pair of Class-D amplifiers and custom-built drivers, all meticulously tuned to the speaker's unique acoustic architecture. We built PLAY:1 humidity resistant so you can enjoy your favorite songs in music-starved places like bathrooms and outdoor patios. All you need is WiFi access and a place to plug it in. Just remember, it's not waterproof or weather resistant. The SONOS Sub delivers amazing room-filling, deep bass sound. 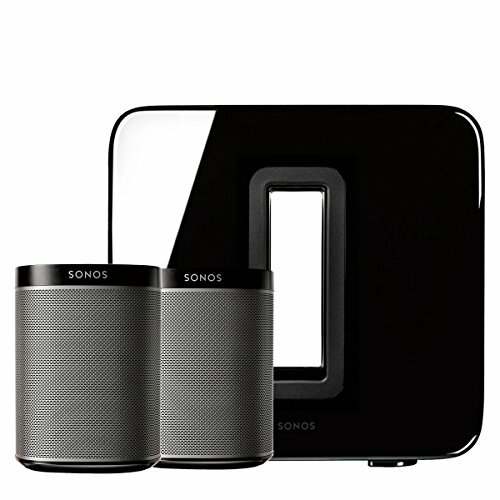 Connects wirelessly to SONOS speakers. Works with PLAY:1, PLAY:3, PLAY:5, PLAYBAR and CONNECT:AMP. Place it anywhere in the room, even lying flat under a couch. Two force-cancelling speakers positioned face-to-face offer deep sound with zero cabinet buzz. Mini but Mighty. The Play 1 fits in any space, fills any room with surprisingly rich and powerful sound. The Sub adds dramatically deeper base to any Sonos wireless speaker. Hear parts of the music you've never heard before.